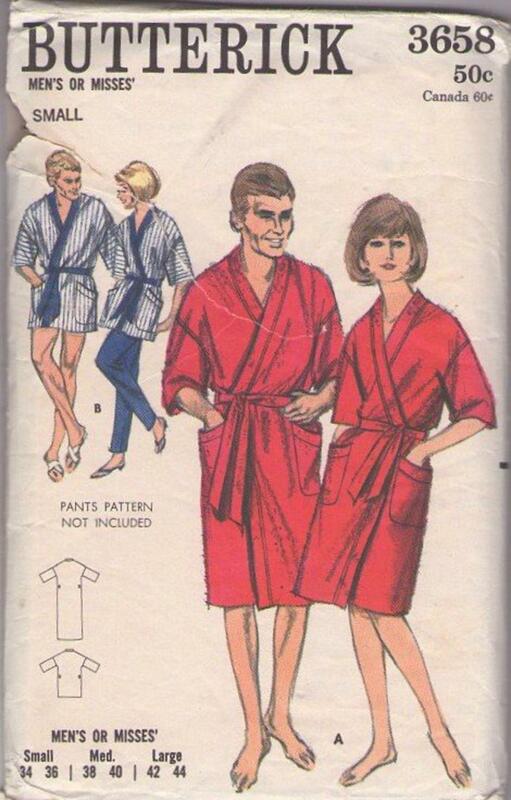 60s Loungewear, Retro His & Hers Clothing Patterns - Men's or misses robe in two lengths! Collarless, V necked kimono robe with patch pockets, elbow length sleeves, tie belt. A: Below knee length robe with self belt. B: Short robe with contrast band trim and belt. Suitable for jerseys, batistes, crepes, flannels and seersuckers! Makes a great his & her gift item! CONDITION: This Original Vintage Sewing Pattern was cut & used. All pieces appear to be complete and intact and have been neatly refolded with the original instructions. Tear on envelope front.